Garden City New York: Doubleday and Company, 1955. Copyright date 1955, first edition, first printing. Presentation Signed By The Author. Tan cover over boards with gilt lettering and design on the spine and on the front board. 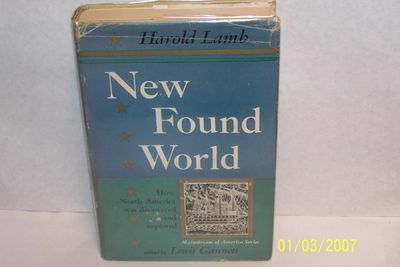 First Edition features history. Covering the time when North America was an unknown land to the time Governor John White. Housed in the original dust jacket and inscribed by the author. Mapped inside covers front and back. Shelf wear to the edges and to the head and toe of the spine are minor. Dust Jacket, no bent flaps, nor is it price clipped. Front and back panel show creases along the top and bottom edges back panel shows soiling, light wear along the spine groove area. Dust jacket now in a clear cover. Text is bright and clean, binding is secure, a solid collectible book.. signed by the Author. First Edition. Hardcover. very good Plus/Very Good. 7¾" - 9¾" Tall. collectible and Signed.